This exhibition brings together, for the first time, the works of two artists working on opposite sides of the world, but both concerned about issues of fragility and identity in relation to their own personal and wider worlds and that of the rhinoceros. Their sculptural works will be framed against the background of a unique 'demand reduction' marketing campaign which targets the consumption of rhino horn. Curated by Catherine Kovesi, a selection of works by Gigi Bon, Shih Li-Jen, and Lynn Johnson will be exhibited in the Magazzino Gallery, Palazzo Contarini Polignac from 24 November until 21 December 2018. To enter the Studio d'Arte 'Mirabilia' of Venetian Gigi Bon is to be introduced to a world of sculptures, prints, and objects of wonder in the tradition of the sixteenth-century wunderkamer or Cabinet of Curiosities. 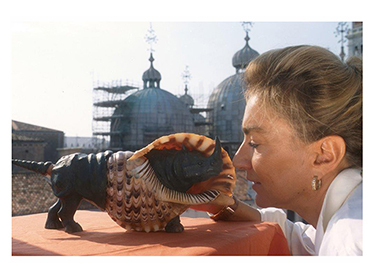 But more than this, it is an entrée into the mind and active working studio of an artist who has a unique vision, developed over more than twenty-five years, of the profound links between her own identity, that of the city of Venice, and the predicament of the rhinoceros. Her artistic oeuvre and in particular her bronze sculptures and sizeable silken scarves, incorporate elements of the precious, the rare, the fantastical, and the whimsical. And all play with these themes of self, Venice, and the rhinoceros. The work of Taiwanese gallery entrepreneur turned artist, Shih Li-Jen, has remarkable resonances yet distinct stylistic contrasts with the work of Bon. 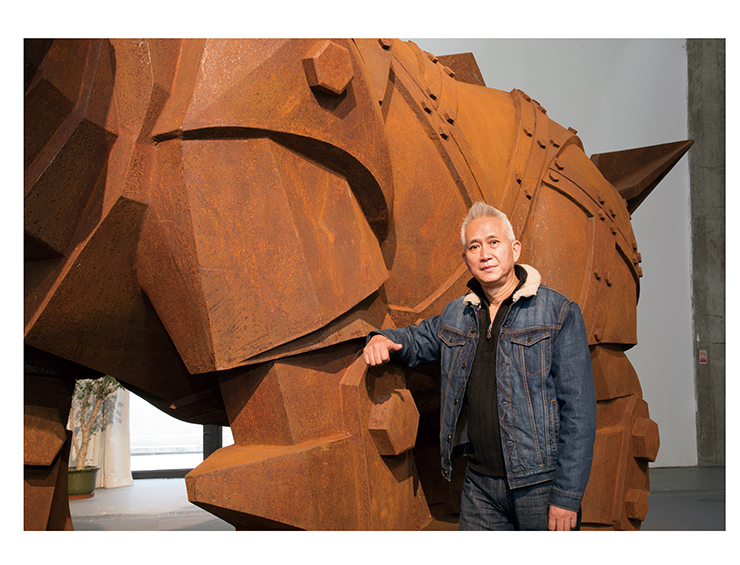 His sculptures and installations, some of enormous height, and on an industrial scale, interrogate the strength yet vulnerability of the rhinoceros and the increasing consumption of its horn in a primarily Asian market. Shih's own name in Chinese characters encapsulates strength and vulnerability, and is often stamped on his sculptures. Shih's work also pays homage to the many traditions of the rhinoceros within an ancient Chinese culture. British-born Australian-based Lynn Johnson is the co-founder of Nature Needs More. 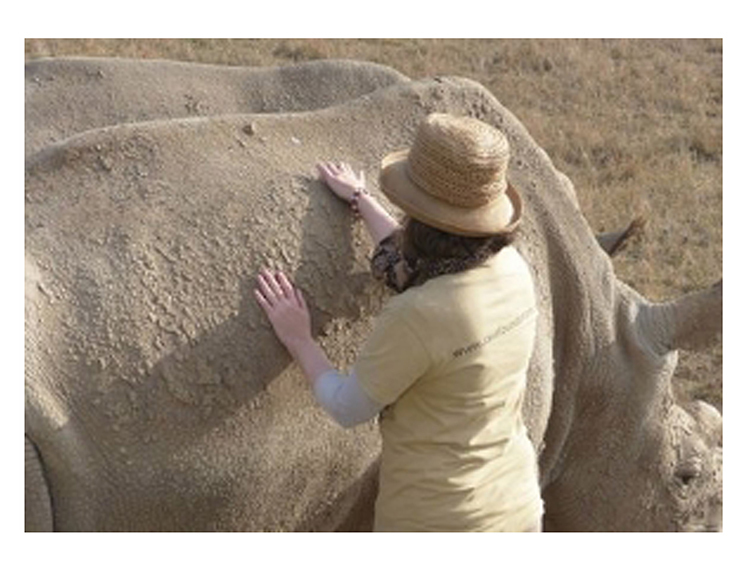 This non-profit organization is dedicated to the implementation of innovative 'demand reduction' campaigns focused on the high-end consumers of wildlife and wildlife products, especially rhino horn. Intrigued by, and utilising the recent artificial branding of rhino horn as a luxury product, Johnson initiated her 'Breaking the Brand' campaign. This has now been expanded to incorporate a related project 'Re-Inventing Magnificence'. We are grateful for the enthusiastic support of Bikem Ibrahimoglu de Montebello who generously offered the use of the Magazzino Gallery at the Palazzo Contarini Polignac for our exhibition and its related symposium Beauty and the Beast: Venice and the Rhino.